Many senior executives talk about information as one of their most important assets, but few behave as if it is. They report to the board on the health of their workforce, their financials, their customers, and their partnerships, but rarely the health of their information assets. Corporations typically exhibit greater discipline in tracking and accounting for their office furniture than their data. More directly, this book is for the burgeoning force of chief data officers (CDOs) and other information and analytics leaders in their valiant struggle to help their organizations become more infosavvy. Start reading Infonomics on your Kindle in under a minute. Becoming data-driven is not just a game, it’s a serious business contest that Laney shows you how to win. The insights, frameworks, and real-world examples throughout this book provide a complete picture of why and how to become an information-savvy organization. Laney’s work redefines information as a true strategic asset, and shows how we CDOs can be instrumental in unlocking new ways for companies to grow and be relevant in the new connected modern economy. We will one day look back at Doug's work and say, it is the groundbreaking work that firmly put data and data leadership in the middle of the business arena not as the white elephant, but as the phoenix; a formal player at the boardroom table. Doug Laney has put together a smart, practical book that applies traditional rules of business economics to the emerging information marketplace. Infonomics is an excellent field guide to knowing what actions can be taken to better measure, manage and monetize your company's data assets now and in the future. Infonomics provides a broad, deep and practical framework that information professionals can build on; it's full of real world illustrations and I think it is a seminal work. If you are serious about "treating information as an asset" then Infonomics is a must read. Infonomics is a must read for business leaders who intend to succeed in data monetization, a requisite organizational capability for firms competing in the Digital Economy. Doug offers rich examples and detailed foundations that leaders can draw upon as they formulate their data strategies. Doug Laney brings decades of practical experience to Infonomics, providing a stepwise framework for C-level executives to answer the ‘Why' to monetize data question, as well as how to operationalize the monetization of data throughout the enterprise and position themselves to innovate, compete and lead in their markets. I recommend this book as a must read to enable full potential of all the idle data in your enterprise. Through a myriad of relevant examples, Doug successfully brings together data management, analytics, and economics in a book that offers practical guidelines to manage, improve, and monetize an organization's data assets. The book is not only a must read for Chief Data Officers, but for any other executive interested in succeeding in the Information Age. Thank you Doug for an engaging read and for giving Data a well-deserved "seat at the table." This is a must have book, not only for CDO’s, CIO’s and Data Strategists but, for any executive interested in creating a data driven, info-saavy company. Laney serves up a treasure trove of insights and observations, while also asking some embarrassingly basic questions that beg to be answered by most companies. The secret is out now. Infonomics encapsulates the characteristics comprising the kinds of companies we favor: they treat and deploy their information as an asset, and fully appreciate its economic value. Since Laney’s pioneering work in data warehousing, he has had a sense of information as something other than a business byproduct or occasionally-interesting resource, and has now graciously passed this on to the rest of us. Since the dawn of data warehousing, information’s real and potential value to organizations in every industry and geography has skyrocketed to the point of underpinning the global economy today. But little has been explored about how to fathom and harvest this value. Infonomics provides the foundation to master what has been intuitively known for years, but not well understood at all. It is essential reading for all corporate management, not just ‘data folks.’"
Infonomics is a pragmatic handbook for C-level executives that will enable them to speak, collaborate, and take action on their newest and most valuable asset: information. Laney is spot on by elevating the "asset status" of information…one to be curated, enriched, protected and monetized judiciously. As it dawns to us what it means to be in the Information Age, our society find itself poorly equipped with the tools, language and levers needed to manage this resource effectively. While qualifying and quantifying information value may not be obvious, Doug Laney shows it can be done. Filled with real-world examples, simple frameworks and straightforward practical advice, Infonomics will benefit business leaders, information professionals and policy-makers alike. Reading Infonomics will be engaging and will constantly trigger thoughts of value creation opportunities awaiting organizations, including ones that are immediate. I highly recommended reading this book regardless of your industry or organizational role. Infonomics is everything you always wanted to know about how to treat and benefit from information as an actual corporate asset, but didn’t even know how or what to ask. It is a must read by CEOs, CMOs, CFOs, CIOs, business leaders, enterprise architects, and everyone involved with data. Doug Laney's, Infonomics, is an engaging read with interesting twists and turns for valuing data assets. I found myself looking forward to every "next chapter." As a current CDO, this book will become one of my most valuable "go to" resources. Thank you, Doug, for this thought provoking read. Infonomics is a must-read for anyone interested in profiting from or managing the rapidly growing information assets held by businesses. It also provides important insights for accountants, who should be thinking about information assets and how they might be reported to business stakeholders. Laney’s engaging style and careful thinking make for a compelling read. Doug Laney's well-researched and compelling text is a much-needed breath of fresh air. Laney formalizes the case for finally treating information as the truly valuable asset that it is. Infonomics challenges longheld―and, quite frankly, largely dated―beliefs about data, governance, and IT roles. It may well make you and your organization uncomfortable in the short term―and that's a good thing. Infonomics easily provides the clearest thought leadership for companies on the true economic value of information. In time, textbooks will be rewritten and balance sheets recalculated to account for the monetary value of information. Doug is pioneering the establishment of this new asset class with inspiring examples, useful metrics and sound logic. Doug Laney makes a compelling case for accounting for information as a corporate asset. Infonomics expertly guides organizations to uncover their hidden treasures and realize economic benefits from information assets. A must read for all CIOs." This is a well-written book in the emerging area combining both information and economics. We've heard enough times that data/information is an asset without any proper blueprint but this book outlines clearly how to measure, manage and monetize information as an asset. This will be the new "Tesla" concept book in the new information and economics arena. Laney was one of the first experts to identify and call out the power of Big Data. Now, in Infonomics, Laney issues a call to action. This book is a welcome addition to the emerging body of serious literature on the power of data in an Age of Information. -Randy Bean, CEO and Founder of NewVantage Partners LLC, and thought-leader and contributor to Forbes, MIT Sloan Management Review, Harvard Business Review, and The Wall Street Journal. This book is essential for any CDO or aspiring CDO. More importantly it should be read by all CEO's who wish to lead a data driven business. The ideas, concepts and examples are well thought through and are rigorous. This will be perpetually on my shelf and on my recommended list. I’ve seen how hard this is first hand to transform a business from a product/feature based organization to one that is not only data driven, but competes based on data assets. Infonomics is a great, comprehensive view on how to approach this change and all the considerations to account for through the journey. 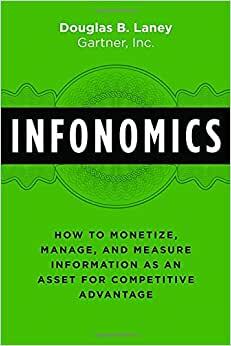 His book Infonomics, one of the most interesting I have reviewed in a long time, is about monetizing, managing, and measuring information as an asset for competitive advantage. (...) This type of holistic thinking is typical of business operations and facilitates the showcasing of how information can be put at the service of the business to create new value and economic growth.(...) The result is an impressive condensation of actionable knowledge that reads well and constitutes a deep source of inspiration and guidance for C-suite executives who care about the linkage between information and competitive advantage, improving how information is accessed and used, and realizing the actual and latent value of information assets. Doug Laney is vice president and distinguished analyst in the Chief Data Officer (CDO) research and advisory team at Gartner, Inc. Doug researches and advises clients on information monetization and valuation, open and syndicated data, analytics centers of excellence, data governance, and Big Data-based innovation. He is the author of Gartner’s enterprise information management maturity model, has compiled several hundred real-world examples of the "art of the possible" with data and analytics, edited and co-authored an eBook on Big Data for the Financial Times, and is a two-time recipient of Gartner’s annual thought leadership award. Around the turn of the millennium, Doug originated the field of Infonomics, developing methods to quantify and harvest information’s economic value, and positing how to apply traditional asset management practices to information assets. He lectures at leading business schools and conferences on the topic, and his articles have appeared in Forbes, Wall Street Journal, and the Financial Times. Throughout his career Doug held leadership roles with global systems integrators and early-stage software companies, and has been a Gartner analyst for eleven years. Doug lives outside Chicago with his wife and son where he bikes, cooks, plays competitive tennis and non-competitive golf, is a volunteer Junior Achievement instructor at a local grammar school, coaches area entrepreneurs, and sits on the University of Illinois Department of Accountancy advisory board. Infonomics is an important book that cuts to the heart of the business of information. For too long, organisations have used technology as a convenient proxy for information - because technology is tangible, has an official financial value and is something that senior executives can be shown to 'prove' that money was spent wisely. Meanwhile, information languishes in a challenging place... intangible, endlessly replicable, undiminished with use... and completely invisible to the CFO who's not allowed to record information as an asset on the balance sheet. Doug does this by challenging organisations to monetise, measure and manage their information assets. He uses great anecdotes from around the world and does so in a very readable style. There are also pages of practical 'how to' steps that create a great action plan. This is a 'must read' book for any executive who wants to embark on the adventure that is digital transformation. 5.0 out of 5 starsGreat stuff here! I especially like Doug Laney’s great book, Infonomics, for several reasons. One, it drives home both the opportunity and challenge in data. First, the opportunity: Doug provides example after example of great ways to monetize data and points out that these are available to all. For many, their best opportunities for growth lie in their data. Now the challenge: Again, example after example, but the one that best drives it home is on page 186, “…that some business people prefer plausible deniability over knowing how poor quality the data is,…” As if bad data didn’t bite them everyday. It is hard to see how a company moves forward under such circumstances. Next, Doug offers dozens of pieces of advice. But I want to crystallize one that is particularly important. Too many people view data as “exhaust,” as in the exhaust from a car taking you somewhere. The notion that information is an asset is completely antithetical to the notion that it is exhaust! Sooner or later, you simply have to find a way to place value in data. The last few Chapters offer an assortment of ways to do so. Read these Chapters with extra care, pick one, and sort out how to use it in your company. Finally, Doug advises companies to start with data quality. In the rush to monetize, too many have lost sight of the importance of quality. Done right, it is the fastest, surest way to save some money, build trust in the data, and gain the practical skills you'll need to move forward. 5.0 out of 5 starsReady or not, you're in the information business. Learn why and how. No matter what industry you're in, you're in the information business. You certainly could be, or should be. In Infonomics, this comprehensive guide by Doug Laney (Gartner, Inc.), you'll be led through the why and how of information as key business assets. There's something here for just about everyone, and the book is structured to benefit those that want to learn and apply the concepts. You have the option of reading it from cover to cover or picking and choosing what's most relevant to you. Doug's writing style helps to make concepts that can be complicated easier to grasp. For each of the three main sections (monetizing, managing, measuring), he does what engaging presenters do: 1. He tells you what he will tell you in a summary; 2. he tells you by providing actionable details; and; 3. he then reviews what he "told" you and positions the upcoming section -- reinforcing what you just learned. He also includes frameworks, graphics, references, and resources helpful for next steps. I've recommended this book to others, and I suspect you might do the same. We're in what Klaus Schwab (Founder and Exec Chairman of the World Economic Forum) terms the Fourth Industrial Revolution -- the age of fusing physical, digital, and biological spheres. Underpinning this age are tech innovations that both generate and are driven by data. Whether the information is originated by you or curated, enhanced, integrated from public/partner sources, he makes this clear: information is key for competitive advantage, and is an asset you can monetize in ways far beyond cash. Why not consider new ways to leverage and provide value with existing and growing mountains of information? Infonomics will help you start and sustain this path in ways that can apply for companies of all sizes. The many case examples recounted in powerful story style will inspire while providing templates you can emulate, as appropriate.